So gorgeous! I loveeeeeeeee the gold and the leaves!!!!!! Ah, lots of fun here and a great job for this super cool card, Colleen. So beautiful! I love the colors and design, it really caught my eye! You should get messy more often then. This card is gorgeous! Love it. Way to stretch yourself. 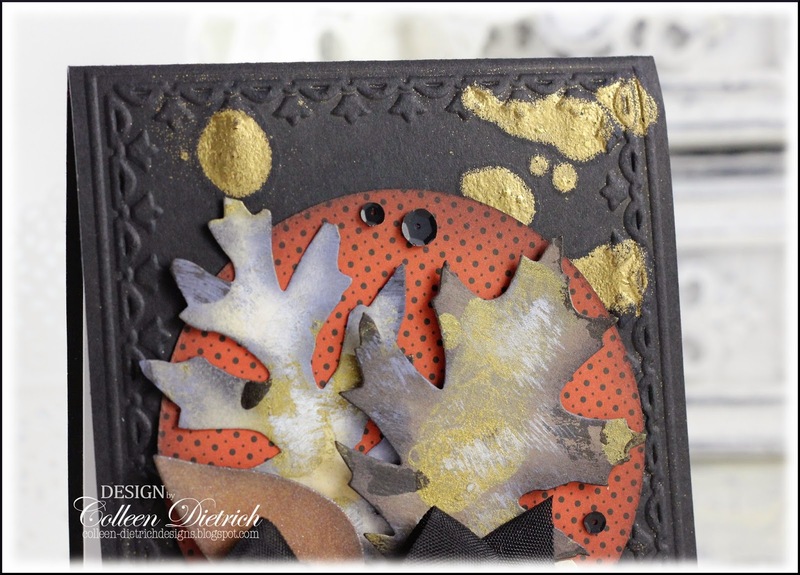 Love the gold splatters and of course the leaves :) Darling touch with the acorn. A great mix of layers, textures and fall colors! My favorite part is that pretty little acorn!! Well, I LOVE the mess! Beautiful as can be! I used to do messy a lot, but not so much anymore. It is fun to play with inks and powders and glitter and all that good stuff. This turned out great. I love the gold splotches and your design and warm colors. Cute to stamp the sentiment on the acorn. Love that!